The exhibit begins with a fitting tribute to the famous collection of Petrarch’s poetry, which itself begins with the inviting words of the introductory sonnet calling the reader to listen to the sound of the poet’s scattered rhymes, “Voi ch’ascoltate in rime sparse il suono.” The Canzoniere was indeed one of the most listened to of all Petrarch’s works. A large number of Petrarch manuscripts are of the Canzoniere, with over thirty copies of the collection in the United States alone. 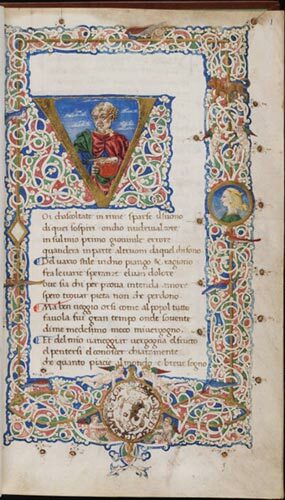 The beautifully illuminated page portrays Petrarch within the initial gold “V” holding a copy of his Canzoniere, with the characteristic Florentine decoration of the bianchi girari (white vinestem), a medallion of Petrarch’s beloved Laura in the border with putti, birds, and animals. The illumination is by Antonio di Niccolò di Lorenzo.